The Fellowship was fortunate enough to obtain a copy of BLOOD BOWL: MORE GUTS, MORE GLORY #1 from Titan Comics. The story is by Nick Kyme, with art by Jack Jadson, inks by Nelson Pereira with Sandro Ribeiro, colors by Fabricio Guerra, and letters by Simon Bowland. BLOOD BOWL is based off the WARHAMMER miniature game from Games Workshop. Nick Kyme is no stranger to the WARHAMMER having written several novels in its universe. He does a fine job of balancing telling Dreng’s story and giving enough information about Blood Bowl is to allow readers (like me) that aren’t familiar with the game. Jadson, Pereira, Ribeiro, and Guerra provide a very nice visual compliment to the script. I’m interested in learning more about Dreng’s tale and this world of the Blood Bowl, so I’m sticking around. Check it out. 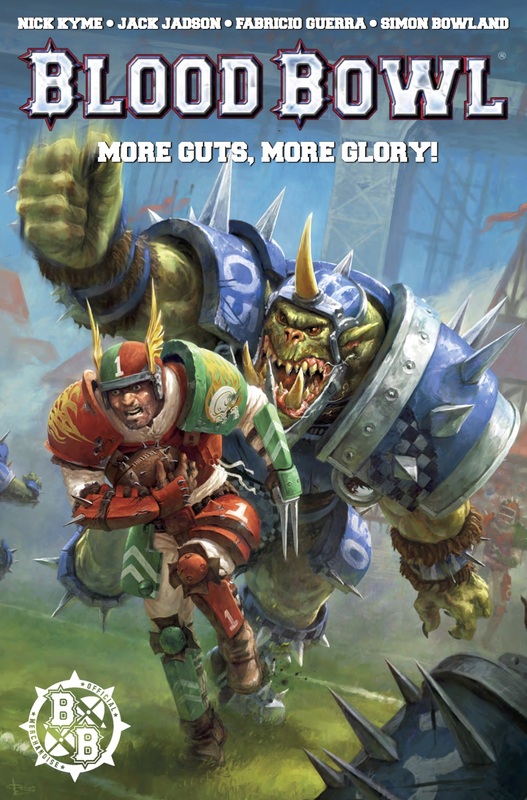 BLOOD BOWL: MORE GUTS, MORE GLORY #1 is at your local comic store or available at www.titan-comics.com.